Once you understand what Service Broker is and finally decides to implement it in your database, you have to enable Service Broker for you database. Let us have a look at it. Once you enable service broker in your SQL Server database, you can confirm whether Service Broker enabled in your database or not. 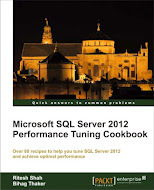 Execute following TSQL in your SQL Server instance. If you get “1” in “is_broker_enabled” field in above SELECT query than you are fine as Service Broker is already enabled now. This entry was posted in Service Broker, sql server and tagged Enable Service Broker, Service Broker on February 13, 2013 by Riteshshah.